Fancy Sea Basses or popularly known as “anthias” is one of the most brightly colored and beautiful exotic marine fish in the aquarium trade. They are one of the hardest fish families to keep in captivity due to their inability to adjust and live in home saltwater aquariums. Most of the time even the most advanced marine aquarist will lament on how difficult it is to make them adapt to artificial fish tank environment and usually the species is categorized among the group with one of the lowest survival rate. Even if they do make it, the mortality rate will keep you wondering where your mistakes are and aquarist who managed to domesticate them are those that have gone through trials and errors to be successful. The reward however of achieving the feat is definitely worth all the trouble. For me, I’ve so far failed in several of my attempts that I’ve decided it’s best to leave this fish alone to the experts. Nonetheless, I will keep my options open and will definitely try again provided there is a chance when I have more time to spend looking after my pet fish. Based on my research, there are several species that made up this diverse fancy basses member. One which I owned and among the most commonly found is the lyretail anthias which has an uncanny resemblance to some freshwater fish. 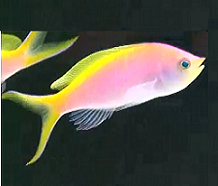 The sunburst or some would call it as fathead anthias has glowing pink body with the front head appearing slightly larger. 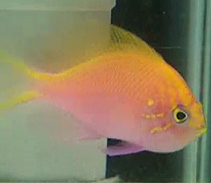 The dispar or sometimes called redfin anthias (due to their unique fin coloration) is another common species which you will come across and the other is the Bartletts with one half of their body in purple and the other half yellow including the tail. You can refer to the pictures provided below for easy identification. Note that anthias is sexual dimorphism species meaning that there is a difference between the male and female fish in terms of structural buildup, body size and color which you can make out. Male lyretails for example are larger in size and the fins will extend longer compared to the females. All the fish no matter how well or how long they have been in the fish tank is natural that they will easily get startled and if that happens, the whole group will dash to a hiding spot. Anthias are best kept in large numbers and if possible, try to avoid putting them with the other fish in a community aquarium. To make your pets feel calmer, always work on to control the lighting in the tank because what I find is that lowering the light intensity level will help but make sure that the setting is not too low until it jeopardizes the growth of your corals. Thus, striking the balance is something learned through trials and errors and with experience. One notable factor is that most fancy sea basses get hunted down in the wild as food fish eaten by larger predators and therefore don’t be surprised that they always get picked upon by their larger tank mates. This is something that you will need to consider before setting up a community fish tank. Aquariums that house the fish need to have a good circulation system with strong current and movement powered by a tank filter unit so that water can also be cleaned at the same time. The fish will mostly prefer to feed on meaty diet and thus crustaceans and brine shrimps will qualify as excellent food options. It would be a good idea to keep them in a reef tank because the species with their behavioral instinct will always need hiding places for them to feel secure. 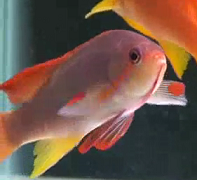 Male anthias can be very territorial and usually they will swim in a group accompanied by a number of female fish. If perfectly cared for, they will present a stunning display of underwater reef world as they actively swim around, moving gracefully as they go about with their daily activities.